SCF Elder Program Supervisor Aaron Osterback works with a Cook Inlet Head Start student plant starts inn an Elder Program Garden bed. This is the second year the Southcentral Foundation Elder Program garden is available for Elders to tend. 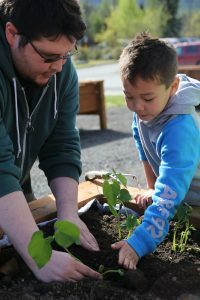 Similar to last year, the Cook Inlet Native Head Start planted seeds in the raised garden beds this spring, which inspired and energized participating Elders and SCF employees alike. Time spent outside provides an opportunity to do fun and healthy activities! Aaron Osterback, Elder Program Supervisor, is committed to bringing healthy outdoor activities to the Elders. He hopes the garden will produce a resource of fresh fruits and vegetables during each growing season. Osterback enjoys sharing his knowledge about growing plants in the short and intense growing season in Alaska. The Elder Program will grow carrots, tomatoes, and potatoes this season, along with a variety of other plants. Trips to the Elder garden offer many benefits to Elders. Scheduled daily walks to the garden provide gentle cardiovascular options, with benches conveniently placed along the way for rest, if needed. The fresh air is a nice boost of oxygen for Elders, which is a great relief after a long winter indoors. After a few months of watering, preening, and removing weeds, Elders are rewarded knowing that their efforts contributed to a successful growing season. The raised beds were designed so Elders would not have to kneel or stoop when working on projects in the garden. This activity is available for any Elder who is interested in gardening, visiting with others and light exercise. For more information about the Elder Program or the garden, or if you would like to make a donation or volunteer, contact the Elder Program at (907) 729-6500.